AddressThe address for this sale in Independence, MO 64055 will be available after 9:00am on Wednesday, May 15th, 2019. NO CARRY OUT... YOU MUST BRING YOUR OWN HELP TO MOVE LARGE ITEMS. All purchases must be removed from premises by end of sale. No carry out available. . All items are Sold As Is with No Returns, Refunds, or Exchanges. Forms of payment accepted are Cash and Credit Card. Black Derby Estate Sales LLC is not responsible for any accidents, liabilities, or claims. 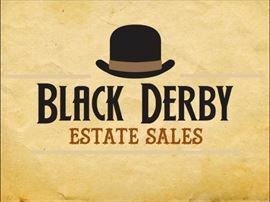 Black Derby Estate Sales reserves the right to Limit Entry when deemed necessary. Photos do not reflect location of items at sale. Statements made day of sale take precedence over printed advertisements. We will accept bids of 51% or greater on items $100 or more. At closing on the night before last day of sale, bid box will be opened and highest bidder on each item will be contacted. Highest bidder will have until noon on the last day (no later) to pay for and pick up item(s). All items not paid for and picked up will be available for sale after 12pm on last day. Please be kind to neighbors and community by not blocking driveways and following the parking signs. Sale will be held Rain or Shine but closed if Blue Springs R-4 is closed due to inclement weather. Look for details here closer to sale date.